« WHAT, I’M NOT AN ARIES? HELP! My husband and I are movie nuts and, therefore, we look forward to the awards shows every year to see if our favorites match up with the voting members. But I also like the shows for another reason—the fashionistas. Not that I will have any occasion this year to go to a formal event, but, if I did, I want to know what is hot and what is not. If my contacts can pull all the right strings I want to be appropriately dressed at Prince William’s wedding. LOL. What is reassuring when I watch these shows is to know that even Hollywood royalty, who have dozens of fashion advisors, hair and makeup experts, and designers fawning over them can still make the same mistakes as us mortals. Last night at the Golden Globes some wore their dresses beautifully and others their dresses wore them (Jennifer Love Hewitt). Some women had problems keeping the girls well contained (Rita Wilson, Eva Longoria, January Jones). Most had simple but elegant hair styles but Jennifer Love Hewitt and Scarlett Johansson went for the extreme. A critic described Johansson’s hair as the bride of Frankenstein and another critic called Hewitt’s hair as the Leaning Tower of Pisa. What was the look Helena Bonham Carter was trying to pull off? She has a reputation for going for the bazaar but last night she looked more like a drugged out ballerina wearing an off-kilter tutu and mismatched shoes. I’m all for individuality—but two different shoes?! And they didn’t even match or compliment the color of her dress. Two who always win the individuality award are Johnny Depp and Robert Downey Jr. They, each have adopted a style that is uniquely their own but do it with class. Their styles always say, young, hip, and put together. I have heard several commentators swooning over January Jones red gown but, to me, it looked like a swimsuit with an attached skirt. The frumpy award of the evening goes to Sandra Bullock. The dress looked like her grandmother’s and the hair with the bangs coming midway down her face makes me wonder what she is hiding from. The most understated look of the evening belongs to Tilda Swinton. It was so understated it was blah. An ivory skirt and a white off the rack shirt just doesn’t make it. My vote for best of the evening is Claire Danes who was stunning in a simple but elegant hot peach gown accented with a large gold cuff bracelet with a band of diamonds. 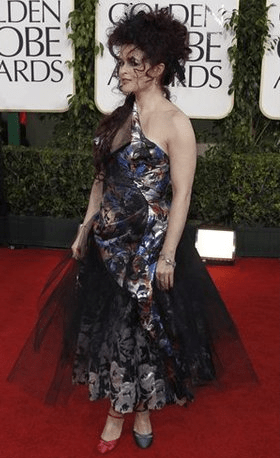 My vote for worst—Helena Bonham Carter.